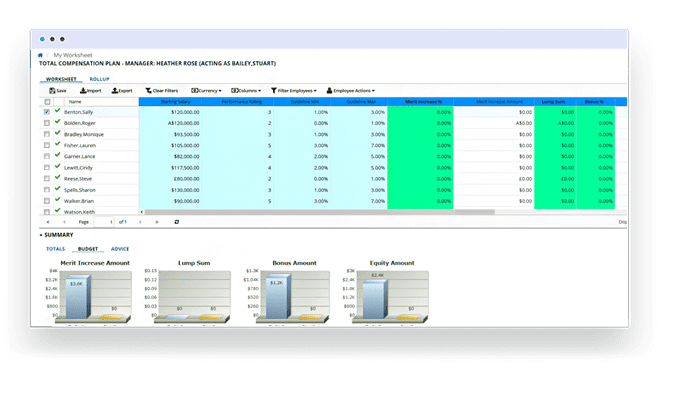 Streamline your organization’s compensation planning, budgeting, incentive management and reporting to maximize the adoption and effectiveness of compensation programs and eliminate the need for manual processes and extensive paperwork – saving you time and reducing costs. That will attract and retain top talent. To enable managers and executives to quickly and easily handle exceptions, approvals and compensation decisions. By supporting the use of multiple plans and currencies in a single organization. SumTotal Compensation Management enables your organization to create effective compensation strategies that align with business demands and the goals of your organization. That will ensure you create the right plan for your organization, and establish standards to guide decisions across the organization. By modeling different budget scenarios, performing budget analysis and robust reporting to drive decision-making and meet the objectives of your business. To guide future compensation and reward decisions. SumTotal’s compensation solution, integrated with SumTotal Performance Management, creates a true pay-for-performance culture, a critical component to engage and retain top talent. By directly linking pay to performance. By basing merit increases and bonuses on an objective and transparent process that aligns with an employee’s performance.